Detroit restaurants are much like you would expect in a city with the size and history as Detroit has, diverse. Yes, you can find all kinds of restaurants in Detroit, but for the most part you can put away your thoughts of having a Trotter, Lagasse, or Puck cooking your dinner, although there are many Detroit restaurants at that level (ie Chef Brian Polcyn of Five Lakes Grill). Detroit is more about real food. The restaurants combine the ethnic diversity, the small neighborhood specialties and the traditional food Midwesterners thrive on to create a food and beverage wonderland that even Anthony Bourdain would have a field day exploring. Any Detroit restaurants dining experience must include a visit to Greektown. The atmosphere, the energy, and the smells of Monroe Street simply pull you right into the restaurants. Our favorites here include the New Parthenon, Pegasus Taverna, and the Olympia Restaurants. Sure, I may be partial to these as they were my favorites growing up some 30 years ago, but traditional ethnic food is just that, traditional, so why would I presume to undermine such a wonderful tradition! Regardless of which wonderful place you decide to dine make sure you experience The spanakotiropita (spinach cheese pie) saganaki ("flaming cheese"), a platter of lamb chops, octopus and baklava. 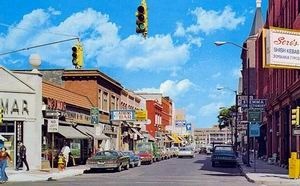 For Mexican restaurants in Detroit there is no substitute for Mexican Town located right downtown. This is some of the most authentic Mexican food I have ever had. The Margaritas certainly add to the appeal. Detroit restaurants also serve up some of the countries best pizza. Thats right I said pizza. Although Chicago and New York are better known for their pizza I would put Detroit pizza up slice to slice. Among Detroits best is Pizza Papolis. Their Chicago style pizza is second to none. Expect a wait during the summer months as I am certainly not alone in my reccomendation but dont worry, its well worth the wait. Detroits version of the Seinfelds soup Nazi is another Detroit favorite - Zoup which has several locations around the city. Nothing can warm your heart and break those Michigan winters like a faboulus soup from Zoups! Some of the best Italian fare outside of Italy. A must visit for those that want to truly explore local favorites and the bounty of the Great Lakes. For that elegant dinner out or to impress clients this steakhouse promises not to disappoint. With one of the best views of the Detroit and Windsor skylines the atmosphere of this popular Detroit restaurant is second only to their superb food.